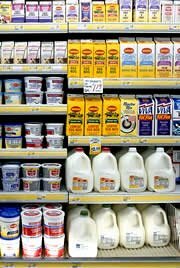 Environmental exposure to a widespread compound used to make common plastic food containers and baby bottles and to line tin cans interferes with cell division in the eggs of female mice, according to research. If cell division is disturbed, it can result in aneuploidy, or an abnormal number of chromosomes in the eggs. This condition is the leading cause of mental retardation and birth defects in humans, including Down syndrome. Even extremely low levels of the compound, called Bisphenol A (BPA), produced genetic abnormalities, according to researchers. BPA exhibits hormone-like properties and imitates the effects of naturally occurring estrogens. Researchers began to study BPA after normal mice began to display genetic abnormalities that are typically uncommon. The defects were linked to plastic cages and water bottles that had been cleaned with a harsh detergent, causing BPA to leak from the plastic. Researchers then determined how much BPA the mice had been exposed to and how small a dose would produce effects. An extremely small dose of 20 parts/billion daily for five to seven days was enough to produce effects. Researchers are uncertain of the effect of BPA on humans, however they noted that mice and humans have a very similar cell division program for eggs. Previous studies have suggested that exposing animals in the womb to levels of BPA similar to those found in the environment disrupts their sperm count, prostate and testicular development. However, other studies, some funded by the plastics industry, have not found any risks associated with BPA exposure. Some experts say that, taken together, study results suggest that efforts to begin reducing human exposure to BPA are warranted.